An ad blocker, a free VPN, a wallet to manage its bitcoins. Without an extension, Opera is today the most complete browser and it opens to Web 3.0 with the protection of private data as a workhorse. The Norwegian publisher Opera has just released the new version of its browser of the same name. Opera, which is based on the same Chromium project as Google Chrome, switches to version 60, also called Reborn 3. This code name is not innocent since the browser becomes the first to conquer the Web 3.0 with the integration of blockchain technology, but also a new graphic charter and an integrated VPN. Web 3.0 is a term used to describe an internet of the future, decentralized, and based on the blockchain. 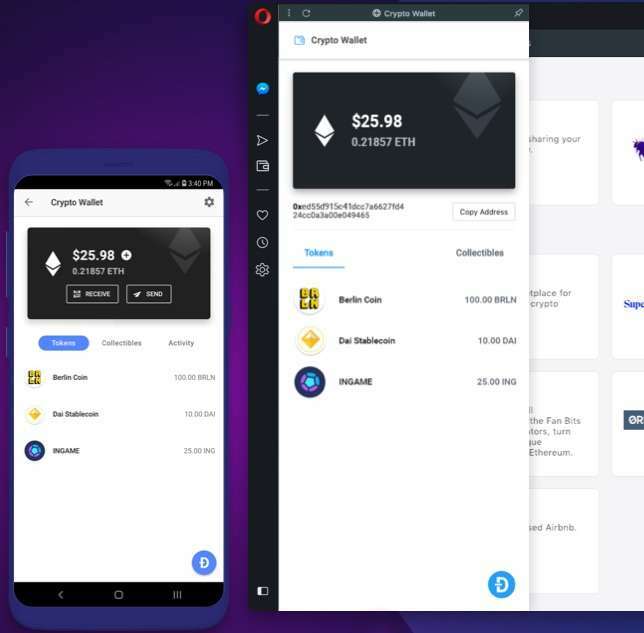 By integrating this technology, Opera becomes the first browser to allow access to Web 3.0 applications by entering the address directly into Opera’s address bar. The inclusion of the blockchain naturally leads to a new feature, with the integration of a cryptocurrency wallet directly into the browser. It will, however, require the use of the Opera browser for Android, with which it will be synchronized. The keys will never leave the smartphone. Opera will use facial recognition or the fingerprint reader of the smartphone to validate transactions or identification on Web 3.0. The feature should also arrive quickly on Opera Touch, the browser version for iPhone and iPad. One of the principles of Web 3.0 and blockchain is security and privacy. Opera continues this logic with its free and unlimited VPN service, added to the Android version of the browser last month. The publisher promises a much faster operation. The navigation data exchanged with the VPN server is encrypted and therefore secure even on a public Wi-Fi network, preventing visited sites from knowing the IP address or location of their computer. The browser interface has also been redesigned to offer as clean a design as possible, with no border and no dividing line between sections “. In addition, it now offers a dark theme. Not to mention the presence of a native adblocker or a tool to capture elements of a page. In order to highlight its privacy protection functions, with the VPN and the blockchain, the publisher has created a sci-fi short film that illustrates a woman trying to regain control of her digital life.